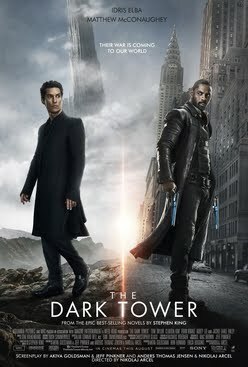 This entry was posted on Friday, August 4, 2017 and is filed under Friday Flicks,Movie Review,Stephen King,The Dark Tower. You can follow any responses to this entry through the RSS 2.0. You can leave a response. I haven't read the Dark Tower books, but it sounds fascinating. I think I'd like the movie better before reading the books, though. I agree. I feel like I enjoyed the movie a lot more because I hadn't read the books first. I haven't read these books yet, but they sound so interesting. I'm happy to hear that you enjoyed the film. I definitely want to see it! I seem to be in the minority, but I just don't understand all the hate for this one. I haven't read the books, so I can't say that it is "a good adaptation". Still, I enjoyed the movie!